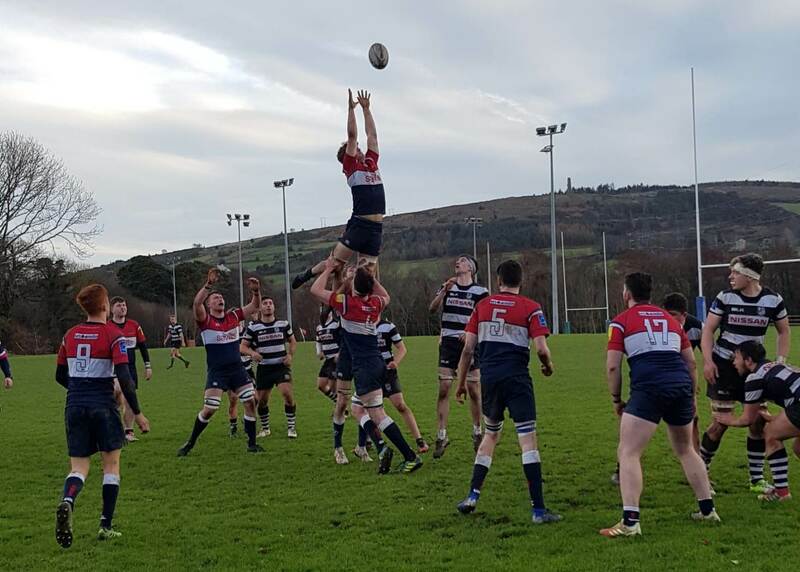 Old Wesley u20s and their counter parts put on a fine display of attacking rugby, by both teams, on a bitterly cold breezy day in Ballycorus. The Old Wesley u20s kept up their winning momentum with a 7 try haul over their close neighbours, Old Belvedere. The game was moved from Anglesea Road to Ballycorus and it took both teams a few minutes to settle on an unfamiliar pitch and the difficult weather conditions. Belvo, playing with the wind, scored first after 10 minutes with a clever tap and go penalty to touch down under the posts to take the lead 7-0. Following the try Wesley began to exert their dominance in the pack with Noonan, Kenny, Bursey, Keane and Motyer all making good breaks into the Belvo 22. Wesley had the more powerful scrum and were unlucky all day not to be given a better reward for this superiority. Stephen Keane scored his, and Wesley’s, first try of the day following a scrum and drive close in. With Shane O’Hanrahan kicking the conversion it was 7 all after 20 minutes. Straight from the restart and confusion in the Wesley defence Belvo scored in the corner but failed to get the conversion that followed moving the score to 12-7. Two quick scores from Old Wesley in the 5 minutes before half time, first by John Ridgeway; following great direct running from Motyer and quick hands across the backline the winger touched down in the left hand corner. The conversion was added and Wesley went in front 12-14. At the restart Wesley pressed forward again and with a splendid kick from O’Hanrahan he was able to put Cameron Madden into space. The openside scored again, leaving the score 12-19 at half time. Wesley were unlucky not to have the bonus point secured with a great break from O’Hanrahan, with Noonan very unlucky not to score with some excellent follow up play. The second half started with Wesley in the ascendancy with another break from Keane leading to a Wesley penalty. From the line out and clever play from Deegan, Stephenson and Hawe, fullback Harry Shaw crossed over at speed, and Wesley secured the bonus point try with 2 minutes gone. The conversion was missed and it was 12-24. Belvedere suffered further disappointment with a yellow card shortly afterwards, but even down to 14 players they enjoyed some fine possession, and were rewarded with a great try and conversion to bring the score back to a 5 points difference and 19-24. Luke Sweeney was introduced for wing Evan Stephenson who was still feeling the after effects of a heavy first half tackle. Old Wesley introduced 3 subs at this point with Calum Kavanagh, Andrew Warner and Fionn O’Loughlin all coming into the team and each added a new dimension to the team. After 20 minutes, Captain O’Hanrahan scored a great individual try following sustained forward pressure in the Belvo 22. Adding his own conversion the scoreboard moved to 19-31. As soon as the restart had been fielded Zak Bursey set off on a run straight towards the try line ,and after a couple of quick phases and interplay Bursey scored a great try, converted again by O’Hanrahan. 19-38. The rest of the bench was introduced with Ben O’Sullivan and Scott Burleigh replacing two players who each had fine games; Shane O’Hanrahan and Eoghan Copeland, whose accuracy in the lineout as well as general play in the loose really contributed to the overall team performance. It was a case of blink and you’ll miss it as within 2 minutes from the restart Stephen Keane broke from the Wesley 10 metre line to break all tackles and score the try of the match; and with Cameron Watson taking over the kicking duties it was 19-45. After that restart, and Wesley’s lack of concentration, the Belvo outhalf jinked his way through some tired bodies and scored a try to leave the score 24-45. The match ended a couple of minutes early following a serious shoulder injury to the Old Wesley replacement, Ben O’Sullivan, who dislocated his shoulder following the Belvo score. We wish him a speedy recovery. With the results of other key matches going Old Wesley’s way, the Under 20s, with 8 wins from 8, are now 9 points clear at the top of Prem 2.